Pamela Ronald is a professor at the Department of Plant Pathology and the Genome Center at UC Davis. She also serves as director of grass genetics at the Joint BioEnergy Institute in Emeryville and faculty director of the UC Davis Institute for Food and Agricultural Literacy. Ronald’s Laboratory for Crop Genetics Innovation and Scientific Literacy is dedicated to “developing a new generation of staple food crops through genetic innovations, education and partnerships.” Ronald’s research includes studying the genetic basis of resistance to disease and tolerance to stress in rice. Together with her collaborators, she has engineered rice for resistance to disease and tolerance to flooding, which seriously threaten rice crops in Asia and Africa. 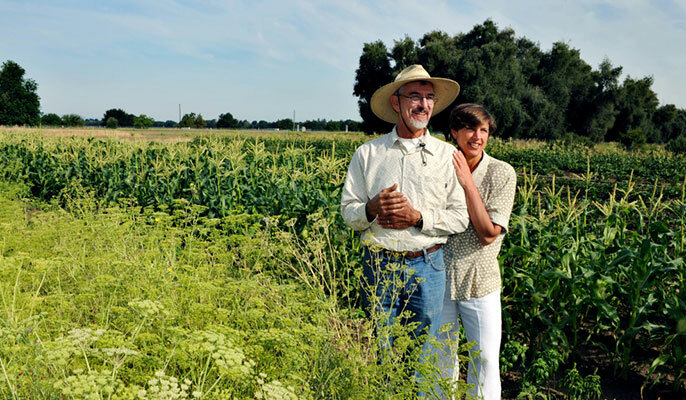 Ronald is also the co-author — with her husband, Raoul Adamchak, who manages UC Davis’ student-run organic student farm — of "Tomorrow’s Table: Organic Farming, Genetics, and the Future of Food." The book argues for a food system that is both organic … and genetically engineered. And it’s earning accolades. Among the book’s fans? Bill Gates. And this is key about Ronald’s work: she’s embracing both genetically improved seed and ecologically based farming methods, as a means to enhance sustainable agriculture. Ronald has emerged – nationally and internationally – as one of the most effective advocates for genetic engineering … and for science literacy. Her TED talk – included at the end of this Q&A – has become a sensation. She’s incredibly busy these days: her work has recently been featured on the BBC and in publications such as National Geographic, Forbes, Nature, the New Yorker, the Nation and Ensia, among others. Ronald graciously found time to chat with the UC Food Observer about her work and to share her insight on a range of topics. Q: Some feel that we’re in the midst of a new Green Revolution. Your work is improving rice and assuring more stable production patterns in Asia and Africa … thus increasing food security. What would you want those who oppose this kind of genetic engineering to understand about your work? Ronald: It’s important to keep in perspective the goals of sustainable agriculture and to not get bogged down in genetic techniques. There are many types of genetic techniques, some that I’m just learning about, and I’m a plant geneticist. For an average consumer to keep up with plant genetics is quite a challenge. What we’ve lost in the discussion about plant genetics are the goals of sustainable agriculture. It doesn’t matter how seed has developed, as long as it’s proven to be safe and is approved by the appropriate regulatory agencies — the genetic methods used in food and medicine are safe for humans and the environment. And there’s consensus on this by all of the major scientific organizations across the globe. Go with science first of all. Then focus on the goals of sustainable agriculture. There are key questions we should be focusing on. For example, how can we use less land and water, or use land and water more efficiently? How can we reduce toxic inputs? How can we foster rural communities, help farmers thrive and help feed the poor and malnourished? How can we improve soil productivity? These critical questions are often lost in discussions because we get bogged down in talking about genetic techniques that have been used safely — some for 10,000 years — and modern ones safely for 40 years. That’s where the disconnect lies. Q: A recent study showed a big gap between how scientists view the safety of GMOs, and how consumers view the issue. What gives? Ronald: The major global scientific organizations agree on their safety. These are the same organizations that most of us trust when it comes to global climate change or the safety of vaccines. We see this with many scientific issues. This particular issue seems to be resonating for a long, long time with consumers. As scientists, we think eventually consumers will get the science right and it will all be okay. But that is not always true. Human opinions have less to do with science and more to do with emotion and the marketing of products … and the marketing of fear. Q: You are a superb science educator. There seems to be a strand of anti-science thought in aspects of our public life. What are strategies that we could use to inject more science into public policy to the benefit of our nation’s civic life? How does the Pope’s encyclical about climate change play into this? Ronald: Have you heard of Science Debate 2008? Perhaps we can revive this model. The project encouraged vice presidential and presidential candidates to comment on key topics in science. It was pretty interesting, and the organization got some candidates to respond. We need to elevate these kinds of scientific discussions to the presidential level. The response to the Pope’s comments on climate change was noteworthy. Some politicians have dismissed his comments. The Pope is saying, “Let’s pay attention to science and how climate change is going to the impact the poor and malnourished, let’s pay attention to this.” We need to inject that kind of scientific ethos at a very high level. The Pope supports Golden Rice, a genetically engineered rice enriched for B-carotene, the precursor of vitamin A that is lacking in the diets of hundreds of thousands poor children (11/7/2013). He gave the rice his personal blessing. It’s great that Pope Francis is getting involved and seemingly cares about the science behind critical issues. That a leading religious figure is paying attention to science and encouraging consumers to use science in public policy making is wonderful, and challenges the stereotype that faith is in opposition to science. Q: Shifting gears a little bit … you’re a researcher and a scientist. What would you want the public to know about public record information requests and scientific research? Ronald: Public record information requests are going on and in some cases, they may be an attempt to intimidate and silence scientists and distract them from their research focus. Happily, the University of California has good lawyers, and I haven’t spent one minute on it. It’s highly inappropriate for scientists to spend any time at all on this kind of thing. I do worry, however, about the possible affects on young scientists. Many young scientists are interested in communicating more with the public and see an information and communication gap that they can fill. They want to have a role in the public sphere, to be available and to answer questions. And clearly, that kind of interaction benefits us all. I fear that the smearing and intimidation campaigns will hinder the enthusiasm of young scientists from communicating freely with the public. Some plant geneticists and journalists have even received death threats for speaking out about science. It is like we are back in the time of Galileo. Q: Whole Foods has recently begun a “Responsibly Grown” program. It provides another set of standards for the produce and flowers that the retailer sells. The system rates both organic and conventionally grown produce. It considers energy conservation, water use and other “environmental and ethical factors. What do you think about this kind of labeling system? Will it benefit consumers? Ronald: I’ve looked briefly at the Whole Foods matrix. It’s certainly good to start to look at sustainability. But I don’t think large corporations are the right organizations to set up this type of label. Whole Foods is now a bigger corporation than Monsanto. The matrix appears to me to be just a form that farmers fill out. Farmers are required to pay a fee to get into the program even though they are already subject to EPA safety guidelines. So this creates more costs for farmers. Whole Foods is not setting up any new regulations and there are no inspections. So it’s good for marketing and for the Whole Foods profit margin but I am skeptical it will enhance sustainable food production. It would be much better if we had a government label – a certified sustainable label – that was not to the benefit of one particular corporation. There is no reason to believe that Whole Foods doesn’t want to do this in a fair way, but there is a huge conflict of interest in making the decisions. For example, say there was a scarce product. A company with their own labeling program could label any of the scarce commodities a “best buy” product, and the consumer would never know. The company would still make a lot of money. There are no teeth to a corporate-sponsored labeling program. Still, it is clear that there is a huge consumer desire for more information about how their food is grown, which is great. The food labeling system needs to be transparent, not just someone in Whole Food’s office filing paperwork. The GMO label in Vermont is completely meaningless; everything is genetically modified, somehow and the label does not provide any information about food safety or sustainability. So I guess I’m a little skeptical of some of the current labeling trends; it’s not in consumers’ best interests to have Chipotle and Whole Foods decide what’s going to be eaten. They are not agriculturalists or food safety experts … they are marketers and business people. With the USDA certified organic label, it’s clear what’s being measured and inspections take place. That label doesn’t necessarily mean a product is certified sustainable, and it doesn’t allow for many new technologies that can reduce food waste and pesticide use, but at least there are clear requirements behind the system. I favor the idea of a USDA-certified sustainable label. It could be difficult on a political level to achieve, however. Q: You and your husband have collaborated on some work, including your authorship of "Tomorrow’s Table: Organic Farming, Genetics, and the Future of Food," which is receiving accolades as one of the most powerful and influential books on this topic, especially for college-aged students. You have carved a sort of via media – a middle road – that is bringing people with different perspectives together … essentially, building bridges. What do you think of this assessment? What lessons might your work hold for others? Ronald: In terms of being “bridge” figures … Raoul and I don’t see ourselves as too different from our friends and colleagues. My husband is a farmer. Most farmers are very interested in sustainable agriculture and are very obsessed with new seed varieties…they love looking through seed catalogs. Many plant biologists are drawn to science because they want to advance sustainable agriculture. It’s interesting that the public has come to believe that organic farming is diametrically opposed to genetics. That’s untrue … organic farmers also rely on genetic improvements. I’m lucky to have a chance to talk to people about this. And I’m happy — as is Raoul — that people are interested. Twenty-five years ago, farmers and geneticists were boring. Now we walk into a room and everyone’s interested in our work. The public interest in the topic is gratifying. Ronald: I would have a certified sustainable label that is transparent and that has appropriate metrics that consumers can access via a barcode, and receive every bit of information about how food was grown. That would include where the food was grown, the genetic techniques used to develop the seed used in its production, comparative metrics with neighboring farms, the pesticides used and the toxicity of those pesticides. This sort of label could transform the food system. Many groups are arguing about what farmers should do. Increasingly, farmers have very little voice. We need to communicate to the public what farmers are doing and how they’re growing food, and the changes they’re making to make farms more sustainable. This needs to be translated so systems can be evaluated and measured, and to enable consumers to make informed choices. It’s very difficult for consumers to learn about farming in the current environment where only 2 percent of the population are farmers.